Devin Mesoraco may no longer be flying under the radar thanks to the flashy way he’s started his season after returning from injury, but his ownership level is still surprisingly low (42% on Yahoo!) so here’s another shout-out to the one-time top prospect starting to make good on his promise. Mesoraco has hit in all 8 games he’s appeared in this year, with multiple hits in 5 of those games to go along with 3 HR, 10 RBI, and 5 doubles. 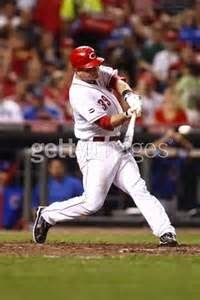 Perhaps more importantly, Ryan Hanigan and Dusty Baker are gone and the Reds are committed to using Meso as their everyday Catcher. This is a guy who was once drafted in the top half of the first round, and was one of the game’s top-rated prospects as recently as 2011. Sometimes, when pedigree meets opportunity, it unlocks the potential thought gone from prospects who didn’t make a big splash their first few times through the League, thus creating a post-hype sleeper that becomes an incredible value. This appears to be the case with Mesoraco, as he’s taking full advantage of the extra playing time and hitting like one of the best offensive Catchers in the league. Even if this early production is a mostly a mirage (I don’t think it is), the upside of him finally fulfilling his lofty expectations (as well as the depth at C this year) make him well worth taking the risk on. Personally, I’d prefer him to any C not named Joe Mauer, Buster Posey, Yadier Molina, Carlos Santana, Brian McCann, or Matt Wieters, but you don’t even have to be that bullish to make the move in a lot of cases. Catcher is deep this year, and there’s not a huge difference between the number 10 Catcher and, say, the number 20 one. So anyone owned in that range should be pretty expendable when someone with Meso’s upside comes around. If Meso flames out you’ll be able to get someone else in that range off the waiver wire anyway, but if he ends up being the next Mike Piazza you’ll be glad you dropped Yan Gomes or Miguel Montero for him. I just dumped Jason Castro for Mesoraco in the one league in which he was available to me. George Springer has been a trendy pickup this week, after a surprise call-up from the Astros put him in a Major League uniform much earlier than most expected. Springer’s minor league numbers absolutely jump off the page (106-37-108-45 with a BA over .300 last year), so there’s no doubt his upside warrants a pickup if he’s still available to you. However, even in that stellar 2013 he had a K% north of 25% (and already has 6 Ks in 18 AB with the ‘Stros), so expectations should be tempered a bit as there’s a pretty good chance he struggles with Major League pitching his first time through the league. Still, category juice pays the bills in fantasy leagues, and Springer is likely to be a plus contributor in HR, SB, and R (as long as he stays near the top of the order, he’s been hitting 2 so far). I can certainly see the upside that makes him worth keeping around but, like many of the game’s best prospects, the hype surrounding his call-up exceeds the actual numbers he’s likely to put up this year. If anyone in your league is willing to part with a proven top 7-10 round hitter for Springer, that’s a deal I would jump on before Springer gave him a reason to change his mind. Depending on how excited managers in your league are about him, maybe you could flip him for a Jayson Werth or Adam Eaton type outfielder. At least test the market for him while his perceived value is at what could be its highest point. Prince Fielder has struggled mightily through the season’s first couple weeks, clocking in with a .194/.316/.343 slash line with just 2 HR and 6 RBI in his first 78 PA. He’s also looked slow and out of shape (though maybe Rangers red just isn’t his color) leading many to believe that last year’s down year was for real and that Fielder is already in the midst of his decline phase. However, his BB% is up 3.4% from last year (up to 13.9%, his career mark is 13%) and his K% is down 3.7% to 12.7%, the 2nd best of his career. He’s been a bit unlucky, sporting a .200 BABIP with a career high 50.9% GB% (which is not good for a power hitter, but still unlucky), but his biggest problem has been making solid contact as his LD% is a paltry 15.8%, almost 4.5% lower than his career average. As we all know, Prince is a big dude, and often times bigger players take a little while longer to get into game shape than the rest of the league. In fact, he may already be getting there as his numbers are bolstered by 3 hits (including a HR) and 2 RBI in his last 2 games. Plus we have not yet hit the summer months in Arlington, when the park becomes a HR haven for LHB, and when we do I believe Prince’s HR/FB (currently 10.5%, well below his career 19.1%, and also boosted by his HR Saturday) will revert to normal and he will end up being the player we all thought he’d be. To me, he’s a buy-low if it’s available to you. A hot-starting power-hitting 1B like Adrian Gonzalez or Mark Trumbo might be a reasonable offer for Prince depending on your league. After a bit of a lull (only 2 hits in 17 AB over 5 games) Chris Colabello is back to his productive ways with 11 hits and 5 RBI during his current 5-game hitting streak. Understandably, Colabello is one of the most added players over the first few weeks of the season as he is now leading the AL in RBI with 19. He’s riding high right now, so he’s definitely worth a pickup if you have a bench spot to fill or need some OF help, but don’t expect this level of production to continue all year. 16 of his 19 RBI have come in 4 games (10 of them in just 2 games), and that kind of isolated production is not usually sustainable. Additionally, while all outlier surface stats will come with outlier underlying stats, Colabello’s BABIP currently sits at an untenable .468. That should regress at least .100 points (his career mark across all levels is .316) meaning his season-ending BA is more likely to be around .259 than his current .359 mark. While his table-setters (Brian Dozier and Mauer) are solid on-base guys, meaning he should continue to see decent RBI opportunities as long as he stays in the middle of the order, he’s unlikely to continue to capitalize on those opportunities like he has in the early going. I’d set the over/under for his season RBI total at 79.5, and I think he will go under on that (yes, even with 19 already banked). I would sell high on him if the opportunity is available to you, but what exactly “high” means can vary. I recently heard of him getting dealt for Brett Gardner, which is technically selling high, but with Colabello’s current surface stats I feel that you can shoot even a little higher than that. Given his situation in MIN, he’s still got enough value to hang on to unless you can address category needs and/or get someone a bit more impactful than Gardner in return for him.